Across the U.S., women pay more than men for certain goods, such as clothes, home health products, and personal care products. This price difference is known as the “pink tax,” since many of these products are packaged in pink. In a country where women earn 80.5 cents for every dollar men make according to the Institute for Women’s Policy Research, this type of price discrimination seems even more unfair. Our latest visualization illustrates the breadth and depth of the “pink tax,” using data from a study commissioned by the New York City Department of Consumer Affairs (DCA). The DCA’s study estimated the price differences male and female shoppers face when buying the same types of items. The DCA derived an average price for 35 different product types based on an analysis of 794 individual items and then compared the prices of the analogous men’s and women’s products. To minimize differences between men’s and women’s items, the DCA selected products that had similar male and female versions and were closest in branding, ingredients, appearance, textile, construction, and/or marketing. Unlike the DCA’s report, our visualization does not include children’s products and only includes the categories of Adult Clothing, Toys and Accessories, Personal Care Products, and Senior/Home Health Care Products. 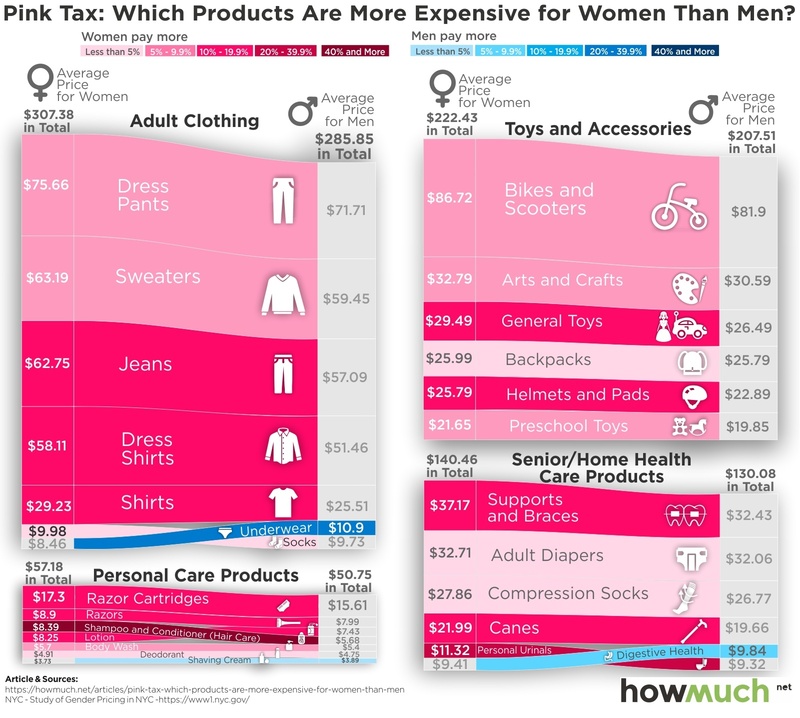 According to the DCA and the visualization, there are only a few products that men pay more for. These products include underwear (29% more expensive), digestive health products (5% more expensive), and shaving cream (4% more expensive). Overall, the greatest price differential is in the personal care category, in which women pay 13% more for products than men. For both men and women, adult clothing tends to be the most expensive consumer product category. Curious about other economic differences between the sexes? Here's our visualization on how much more money American men earn than women at every age.